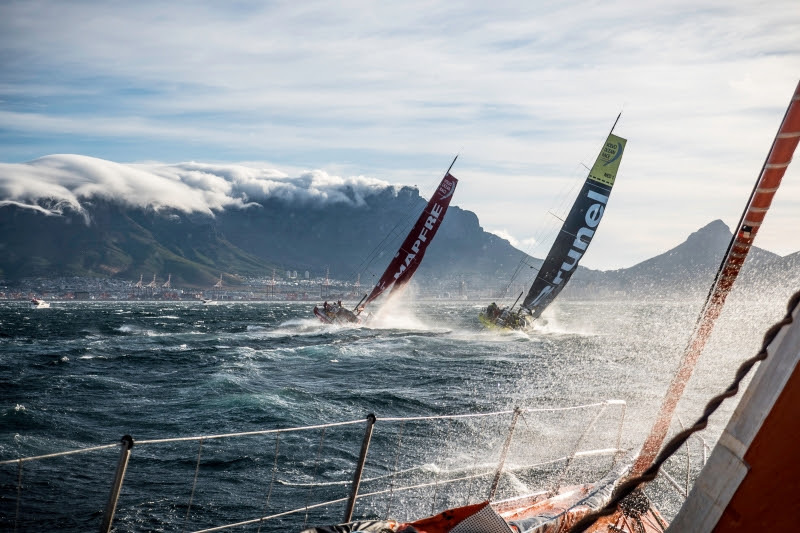 The Volvo Ocean Race 2017-18 shifts into a new phase on Sunday with the start of Leg 2, a 7,000 nautical mile, three-week, marathon leg to Cape Town, South Africa. It’s one of the iconic legs of this offshore classic, as the teams transition from the North Atlantic, through the Doldrums, into the trade winds and may even dip a toe into the Southern Ocean before the finish in Cape Town, which has already been a stopover host 10 times. The tactical options on the leg have been opened up this year by the removal of a traditional waypoint, the island of Fernando de Noronha, about 170 nautical miles off the coast of Brazil. While teams often sail as far west as this to pick up the tradewinds earlier, it adds hundreds of miles to the route to Cape Town. Without this island as a mark of the race course, the shorter, but normally slower option of sailing further east, down the coast of Africa, may be in play. But it’s not clear that will be the case this time. “It’s a leg of 21 or 22 days with technical decisions to make every day,” said Simeon Tienpont, the skipper of team AkzoNobel, who has added the experience of Chris Nicholson, Jules Salter and Peter Van Niekerk to his crew for this leg. In contrast, for many of the rookie sailors spread across the teams, Leg 2 will be the longest they have been at sea, and a new experience of true offshore sailing. Bouwe Bekking, sailing his eighth Volvo Ocean Race as skipper of Team Brunel, will take World Sailor of the Year and reigning America’s Cup winning skipper Pete Burling on his longest offshore sojourn, including a first Doldrums crossing that traditionally calls for a visit from King Neptune. But first there is the start, including an inshore leg up the Tagus River to the Lisbon city front, before the teams break to the Southwest for a drag race down to the warmer latitudes. The forecast is for 15 to 18 knot Northerlies on Sunday afternoon – it should be a fast start. The first long leg of the 2017-18 edition – a 7,000nm Atlantic dive from Lisbon to Cape Town – begins on Sunday 5 November, and you can catch all the action live on our channels. With a leg projected to take the fleet around 21 days to complete, a solid start is key – and the boats will battle for every inch as they leave the Portuguese city after a third consecutive stopover.